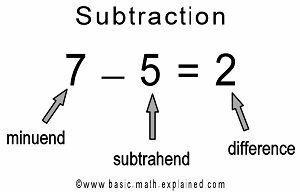 Subtraction is a mathematical operation; it is a process or action that you do with numbers. It is the process of finding the difference of 2 numbers. The symbol used is: - (minus). In this process, we take a number and reduce it to a smaller number. That is, we take away one number from another. 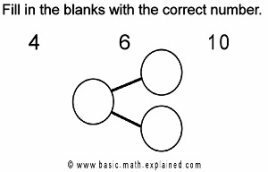 Click here for some problem sums on Addition and Subtraction. The difference of 7 and 5 is 2. Here are some ways to help your child understand how to subtract. Give your child some counters (buttons, coins, paper clips or other small things). Ask her to count the items. Refer to the number chart if your child forgets her numbers. Count and remove some of the items. Ask her to count the remaining items. Remember to use Math terms like subtract, difference, left over, remainder and so on. 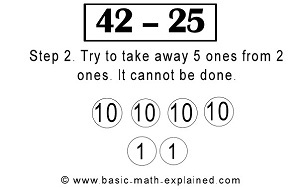 Examples: "Let's subtract 2 from 9" or "How many do we have left?" Do this a few times with different numbers of objects. Now make it into a game. First, count the number of items together. Then secretly remove some of the items. Let her count the remainder, then ask "How many ... did I remove?" After she gives the answer, let her count the items you removed to check if she is correct. Remember to let your child test you too. Children feel more in control of their learning if you let them explore the subject by asking questions. 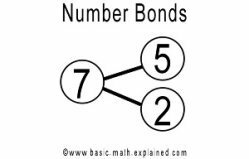 Number bonds is a basic Math concept that can help your child understand subtraction as well as addition. 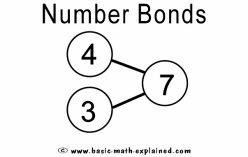 A number bond shows two numbers being joined to form a bigger number (as if a number is made up of different parts). The reverse is also true. A number can be broken into smaller numbers. 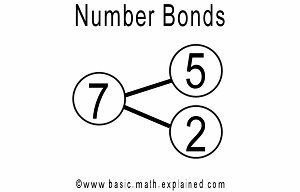 This number bond shows that two smaller numbers (3, 4) can combine to make a larger number (7). 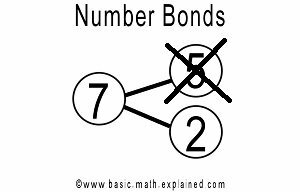 This number bond shows that a larger number (7) can be 'split' into two smaller numbers (5, 2). Use physical objects like buttons, toys and so on to demonstrate the idea of number bonds. Give your child a bunch of items. Let your child count and write the number in the circle on the left. Separate the items into 2 groups then count and write the numbers in the circles on the right. Now let's put the ideas together. 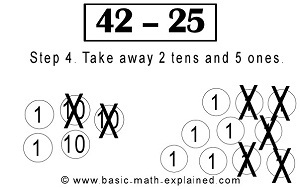 You can also draw pictures or models to help your child understand subtraction. This is a very useful method as it can be used to help your child understand very complicated questions later on. Learn more about drawing models method. 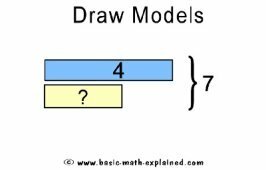 In drawing models, we draw boxes instead of circles to represent numbers.The main idea is still the same - numbers can combine to to form larger numbers or be broken into smaller numbers. This method can be more accurate because we can draw bigger boxes to represent bigger numbers. This will be really useful later on when dealing with large numbers. These help your child understand that addition is about combining numbers while subtraction is about breaking numbers. Once your child has understood the concept of finding the difference, it is time to learn to write a statement or equation. Subtraction is the idea of 'taking away'. 7 - 5 means taking 5 away from 7. The number you take away from is called the minuend. It is the biggest number in the equation. 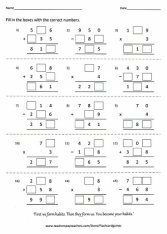 Let your practice with sets of 3 numbers that can be used to form a subtraction statement and let him write the statement on his own. Ask him to check his answer using real counters. You can print some templates here. 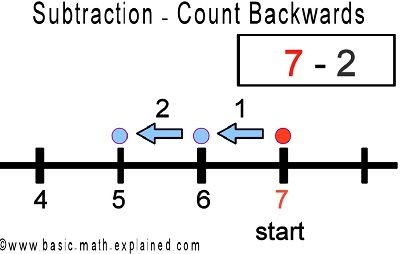 The process of subtracting is similar to counting backwards. You can show this on a number line. Write the first number (minuend) in the subtraction statement on the line. Count the number of steps backwards that correspond to the second number (subtrahend), writing the numbers on the line as you count. The number that you land on is the answer (difference). Click here to use the template I've created to explore different ways of adding and subtracting. Some children associate addition and subtraction with the terms 'more than' and 'less than'. This may not always be the case. Click here for a worksheet on 'more than' and 'less than'. Use the template to create more questions for your child. 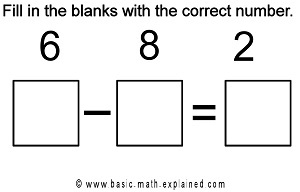 Try to figure out whether addition or subtraction is the correct operation to use to get the correct answer. 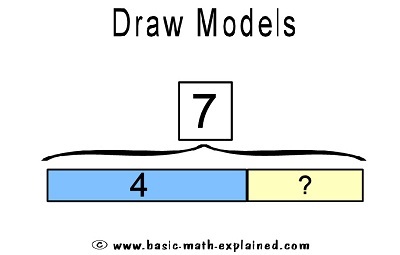 Try to apply the strategies you've learned like drawing models or using a number line. Remember to let your child set questions to test you. Make it a family math challenge. Do you find this page useful? Share it! 1. 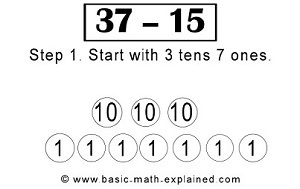 Start with 3 tens and 7 ones to show 37. 2. 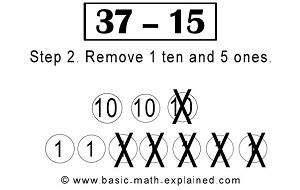 Remove 1 ten and 5 ones (for 15). 3. We are left with 2 tens and 2 ones to form the number 22. 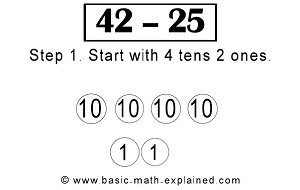 We start with 42 (4 tens and 2 ones). Try to take away 5 ones from 2 ones. This cannot be done. 3. 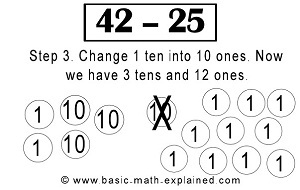 Change one of the tens to 10 ones. Now we have 3 tens and 12 ones. 4. Take away 2 tens and 5 ones. 5. We are left with 1 ten and 7 ones or the number 17. Share this information with your family and friends who want to help their children build a strong foundation in Math.